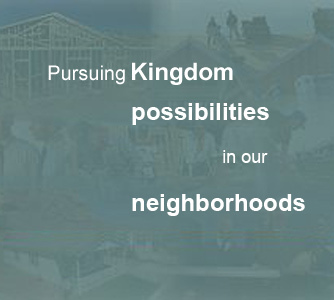 Nehemiah CRC – Committed to Creating Neighborhoods of Hope for All South Carolinians. 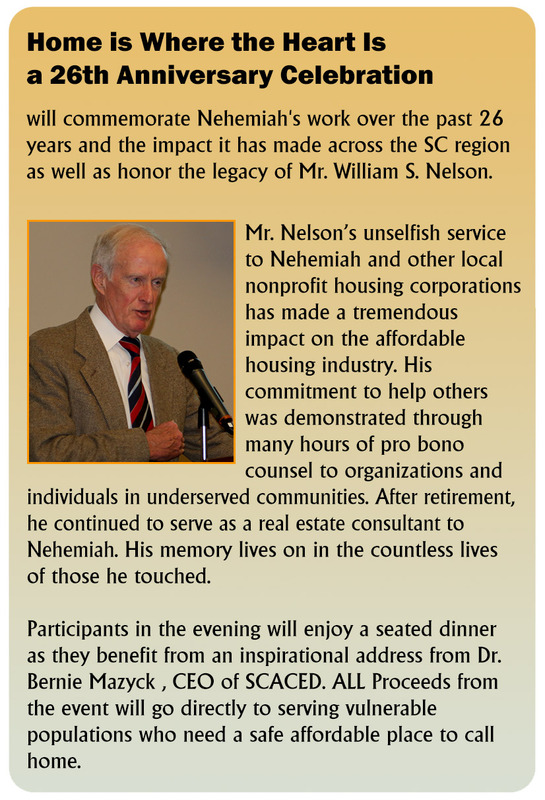 FRIDAY, FEBRUARY 22, 2019 | 7 – 9:00 P.M.
Home is Where the Heart is – a 26th Anniversary Celebration will commemorate Nehemiah’s work over the past 26 years and the impact it has made in the lives of families and communities across SC. Proceeds from the event will go directly to serving vulnerable populations who need a safe, affordable place to call home. 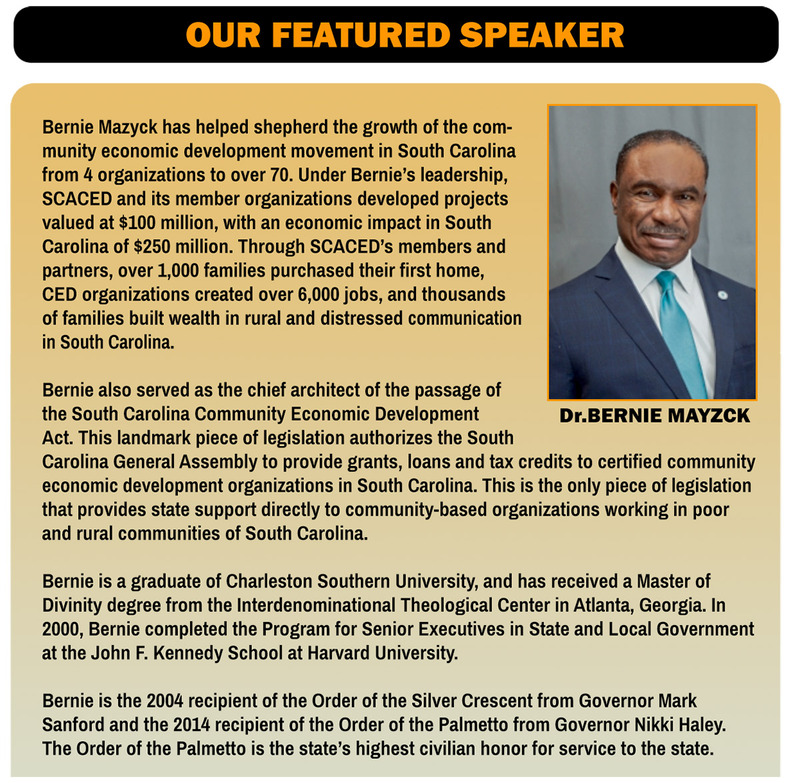 Participants in the evening will enjoy a seated dinner as they benefit from an inspirational address from Dr. Bernie Mazyck (CEO of SCACED – South Carolina Association for Community Economic Development). In addition to celebrating over a quarter century of building affordable homes we will also recognize a valuable leader and champion for our cause, Mr. William S. Nelson. We are excited about bringing together our partners and friends in celebration of our 26th anniversary and our collective efforts to provide housing and support to individuals and families in need. We hope you will join us in the celebration! FRIDAY, FEBRUARY 16, 2018 | 7 – 9:00 P.M.
Home is Where the Heart is – a 25th Anniversary Celebration will commemorate Nehemiah’s work over the past 25 years and the impact it has made in the lives of families and communities across SC. Proceeds from the event will go directly to serving vulnerable populations who need a safe, affordable place to call home. Participants in the evening will enjoy a seated dinner as they benefit from an inspirational address from Robert Lupton, community developer and author of the well-known book, Toxic Charity. In addition to celebrating a quarter century of building affordable homes we will also recognize a valuable leader and champion for our cause, Tom Faulkner. Tom will be retiring from Nehemiah CRC after 25 years of service. He has left an indelible mark on our state as he has led the challenge for Nehemiah and strengthened community after community by making affordable housing a reality for many. supports to individuals and families in need. We hope you will join us in the celebration! Bob Lupton has invested the past 46 years in inner-city Atlanta. He left a budding business career to work with delinquent urban youth. Bob and his family sold their suburban home and moved into the inner-city where they have lived and served as neighbors among those in need. His life’s work has been the rebuilding of urban neighborhoods where families can flourish and children can grow into healthy adults. Bob is a community developer, an entrepreneur who brings together communities of resource with communities of need. Through FCS Urban Ministries – a non-profit organization which he founded – he has developed three mixed-income subdivisions, organized two multi-racial congregations, started a number of businesses, created housing for hundreds of families, and initiated a wide range of human services in his community. He is the author of six books, including the bestselling Toxic Charity. Bob has a PhD in psychology from the University of Georgia. Copyright © 2019 · Nehemiah Community Revitalization Corporation. All Rights Reserved. Customization by Giraffe Web.